Since its statehood in 1848, vast acres of California land, including the mountain areas along the coast, had been cleared and settled by ranchers. 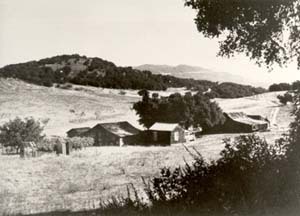 In 1872, Jose Jesus Pico decides to build a small adobe home for his family, using the clay of the surrounding hills of Refugio Pass, high above the Pacific Ocean. For years, he and his family prosper by growing vegetables, cultivating vineyards, and raising livestock. 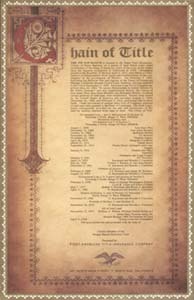 Finally, in August of 1898, he acquires title to the land through the Homestead Act of 1862. 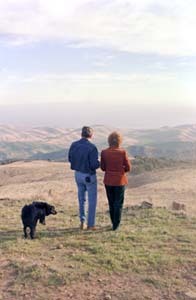 Ronald and Nancy Reagan purchase “Tip Top Ranch” nestled in the Santa Ynez Mountains north of Santa Barbara. 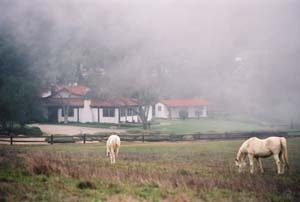 They christen the ranch retreat “Rancho del Cielo.” Reagan appreciates both the early history of his beloved “Ranch in the Sky” and the efforts of the man who built it by hand more than 100 years earlier. 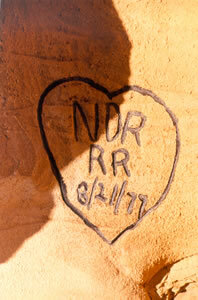 One day in May 1977, as the Reagans ride their horses together along a trail at the Ranch overlooking the Pacific, Ronald Reagan stops to engrave his and Nancy’s initials in a rock now known as “Heart Rock.” He also gives Mrs. Reagan a canoe named “Truluv” to use on Lake Lucky. 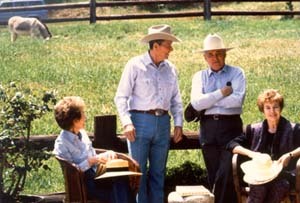 Vice President George H. W. Bush and his wife Barbara visit the Ranch, arriving at approximately 2:00 p.m. on a Saturday. 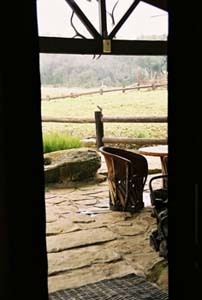 The Texans have never seen a ranch anywhere in the Lone Star state quite like Rancho del Cielo. The president and vice president meet to discuss the latter’s recent trip to western Europe. This is the first of several visits to the Ranch by Vice President Bush. 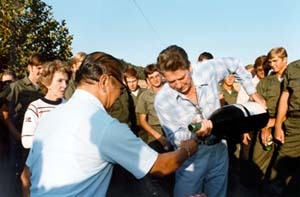 In a day that includes a chat with Secretary of State Alexander Haig, horseback riding, chopping wood and clearing brush, the Reagans host a barbecue for the Seabee Navy Construction Battalion that assisted with construction of temporary structures at the Ranch–the facilities necessary for transforming Rancho del Cielo into the Western White House. 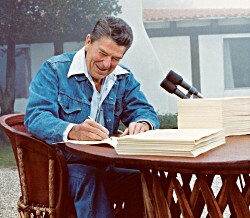 In a ceremony at Rancho del Cielo, Ronald Reagan signs the Economic Recovery Tax Act. 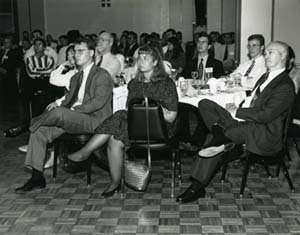 He secures a 25% across-the-board reduction in federal income tax rates over a three-year period starting in October 1981. Eventually, through this and subsequent cuts, the upper income marginal tax rate is reduced from 70% to 28%. Ronald Reagan hosts Queen Elizabeth II and Prince Philip at the Ranch. The day of the Royal visit is very rainy and the winding road to the mountaintop retreat is barely passable, yet the Queen insists on making the journey. The visit is spent indoors by the warmth of the fireplace stoked with wood that Reagan has cut. 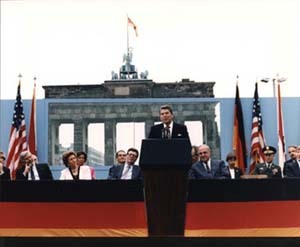 In a speech in Orlando, Florida to the National Association of Evangelicals, Ronald Reagan calls the Soviet Union “the focus of evil in the modern world”–an “Evil Empire.” At the Permanent Labor Camp 35 deep within the Soviet gulag, Anatoly Sharansky and his cellmates hear the news and rejoice that, at last, someone in the West has spoken the truth about the USSR. 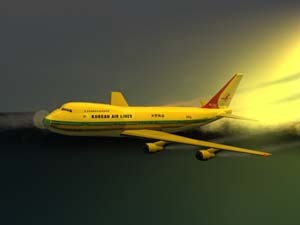 At Rancho del Cielo, Reagan learns from National Security Adviser Bill Clark that a Soviet fighter aircraft blasted a South Korean commercial airliner Flight 007 out of the sky, en route from New York City to Seoul, killing 269 passengers–including 61 Americans. The Soviets initially deny responsibility, but later admit their guilt. 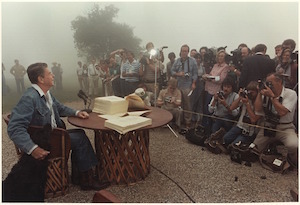 Prior to his radio address from the Ranch, Reagan, not knowing that the microphone is ‘open,’ makes a humorous remark about Russia, “My fellow Americans, I’m pleased to tell you today that I’ve signed legislation that will outlaw Russia forever. 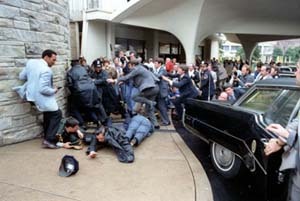 We begin bombing in five minutes.” In his diaries Reagan writes about the ‘open mic’ incident saying: On one of them I gave the press an opening to display their irresponsibility which they did. Doing a ‘voice level’ with no thought that anyone other than the few people in the room would hear I ad-libbed jokingly something about the Soviets. The networks had a line open and recorded it and of course made it public–hence an international incident. 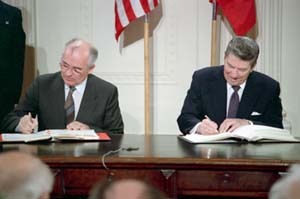 At the Washington Summit, Reagan and Gorbachev sign the INF Treaty, the first and only treaty to successfully ban an entire class of nuclear weapons, namely medium-range missiles. 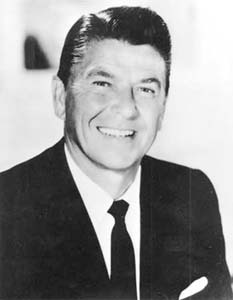 The agreement fulfills Reagan’s first-term objective of a “zero-zero” balance on these weapons. 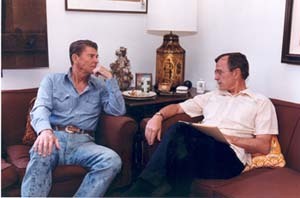 The Reagans host Mikhail and Raisa Gorbachev at the Ranch. Only five months earlier, on December 25, 1991, Gorbachev resigned as leader of the Soviet Union, thereby also permanently disbanding the USSR itself–its principal part is once again just Russia. The Evil Empire has at long last been resigned to the ash-heap of history. For the first time, the two former superpower leaders enjoy a friendly day not as adversaries or negotiators but now as friends who changed the world. 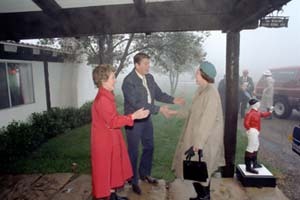 On the foggy day in February following the celebration of the President’s birthday at the Reagan Presidential Library the previous night, Lady Margaret Thatcher, 71st Prime Minister of the United Kingdom, visits the Reagans at the Ranch. Lady Thatcher is gracious as she tours the humble ranch home and pauses in front of the fireplace to express her joy at finally being able to visit Reagan’s beloved presidential retreat. 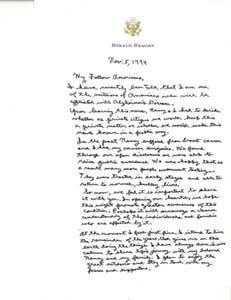 As they chat about the weather, the Reagans apologize for the foggy conditions to which she remarks, “I love the fog.” She asks about the home and its history. The President tells her about the history of the property and what they have done to improve it over the years. 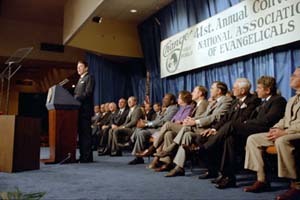 Reagan addresses Young America’s Foundation’s 15th Annual National Conservative Student Conference. 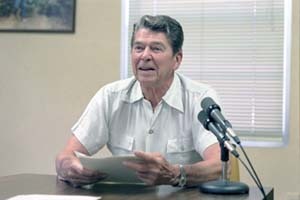 Recalling his longtime collaboration with the Foundation the 40th president says, “Together we worked to accomplish much of what has come to be known as the Reagan Revolution. 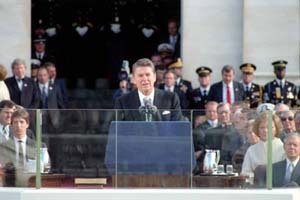 We helped turn the tide against totalitarianism.” In those 15 years, says Reagan, he and they have witnessed a rebirth of liberty worldwide. 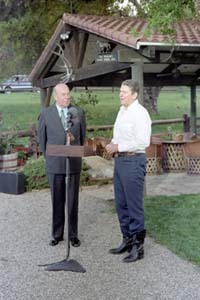 Ronald Reagan makes his final visits to Rancho del Cielo during the hot days of late August. Where he had previously enjoyed physical activities such as horseback riding, cutting brush and fixing things, the activities he can do with ease become fewer and fewer. Since the president can no longer enjoy Ranch activities as he once did, the time has come to say farewell to his beloved mountaintop retreat, an ‘old friend’ that has served him well for nearly twenty-one historic and memorable years spanning his governorship to his post-presidency. 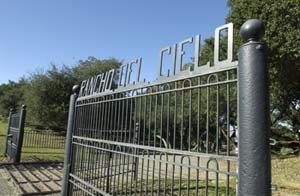 Rancho del Cielo is sold to the Young America’s Foundation. The Ranch is now preserved as it was when President Reagan owned it, having been saved with most original artifacts and memorabilia intact. 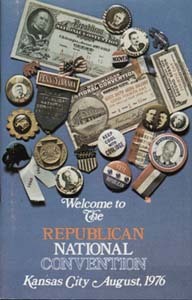 It now lives on as a monument to the life and ideas of Ronald Reagan.